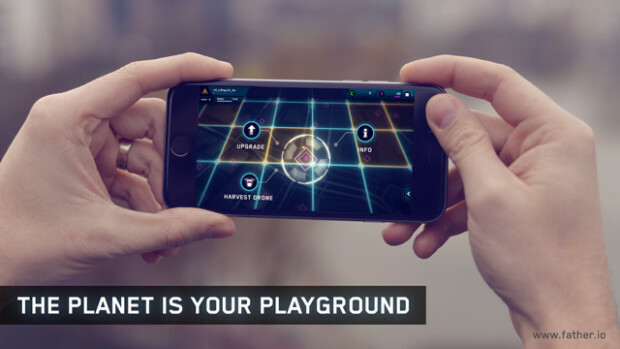 Father.IO is the world’s first real-life, massive multiplayer, first person shooter.Experience the adrenaline, tactics and strategies of gaming in your everyday life. 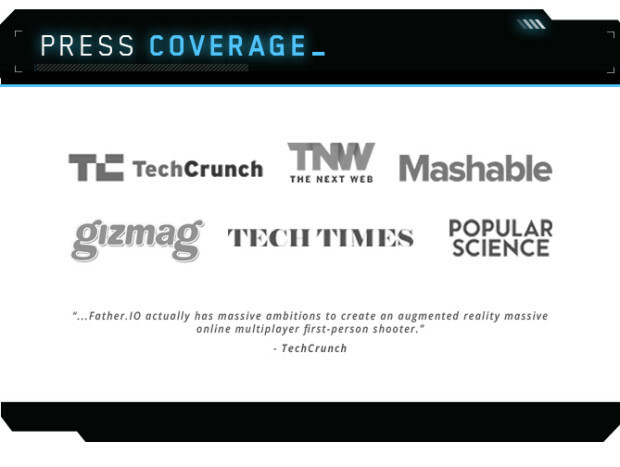 Combining real time geo-localized strategy & first person shooter battles, Father.IO brings a virtual world into your backyard. 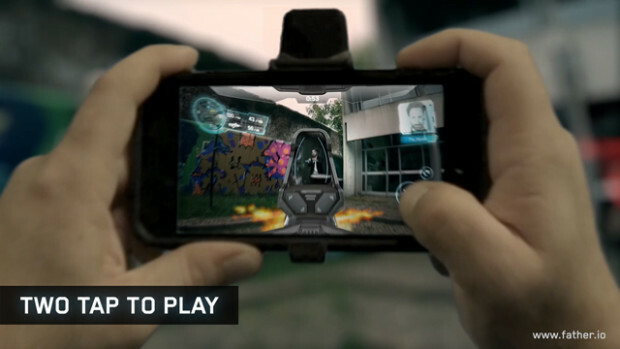 Plug the INCEPTOR into your phone and the battle begins. Claim new territories for your faction and expand Areas as you level up. 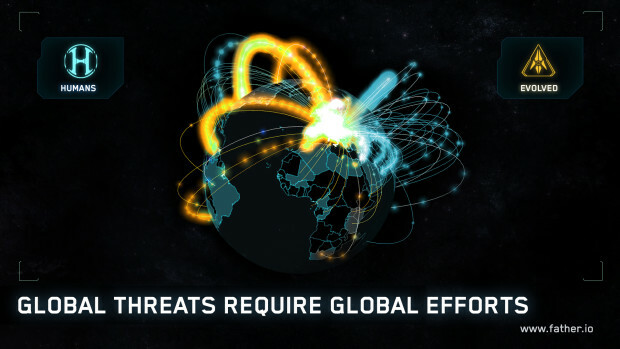 Claim resources by interacting with over 12,000,000 real-world locations. Utilize schools, businesses, grocery stores, parks, banks, retail stores and more! Steal resources from enemies to strengthen your faction. Use resources to purchase weapons, ammo and gadgets, or to invest in Area infrastructures. You can even build virtual structures! Real world buildings have an impact on the gameplay. Control an Area with a university to give yourself a research boost. A pharmacy or hospital in your Area results in faster recuperation. 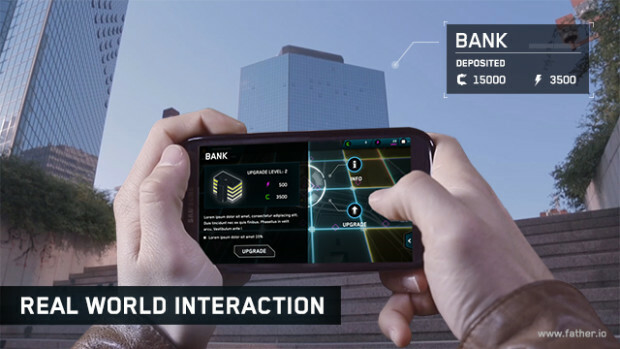 Claim an Area with a bank to securely store resources. Right Now: Our full app is still in development. In the meantime, you can download the Father.IO Tactical Map BETA prototype. Android: Download BETA by clicking the below button- downloads are unlimited! iOS: iOS limits BETA downloads to 2,000 users. To request iOS access, click the button below and add your information to the sign-up form. If there is a spot available, we will be in touch with iOS Father.IO Tactical Map BETA download instructions. These BETA options offer limited functionality- you’re acting as our testers! Please provide your feedback here. At Launch: Everyone will be able to download the FREE app for both Android and iOS. You can then use the web-app and/or the mobile-app, to complete quests, harvest for resources, and help your faction. With the Inceptor, you’ll be able to access the First Person Shooter mode, conquer and defend Areas and unlock all features of Father.IO! Teamwork is everything. 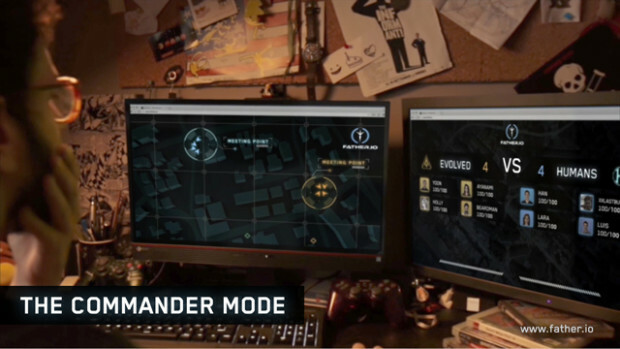 Connect from your browser, via our web-app (available at launch) to follow battles in real time in commander mode – tell your team the right moves and warn them of nearby enemies. Battles are pre-organized on the basis of weekly attacks: the greater the strategic importance of the objective, the greater the game area, the number of participants and the organization time. Invite friends or a group to participate and share your matches on your social networks. 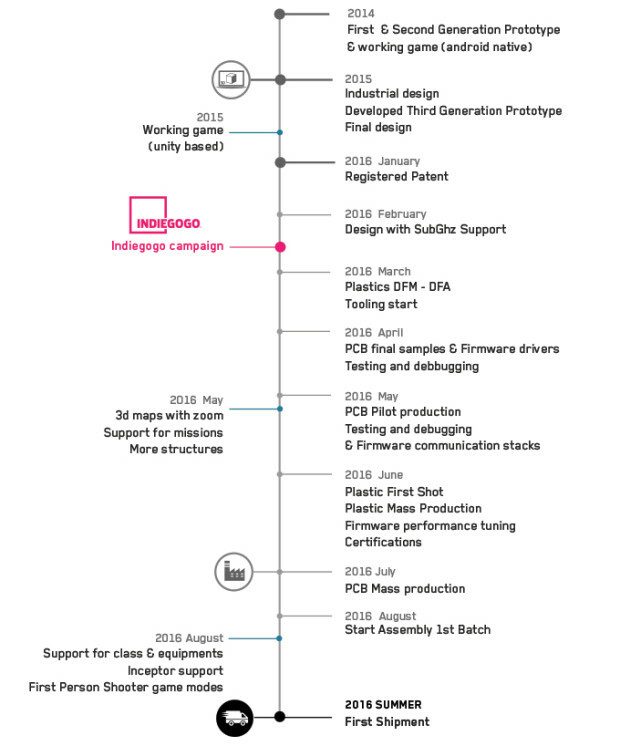 The game design behind Father.IO is built around repeatable, 3-month worldwide battles. Humans and the Evolved will be given specific global missions, based on scripted geo-localized worldwide side-quests. The results of these missions will shape the end of the game and the future of Humans. This allows new players to be competitive while learning the ropes, while more experienced players unlock advanced classes and loadouts, moving up in ranks. Create local indoor/outdoor battle instances, challenging nearby players equipped with the Inceptor to a team or free-for-all deathmatch. Additional game modes, such as capture the flag, are available as stretch goals. 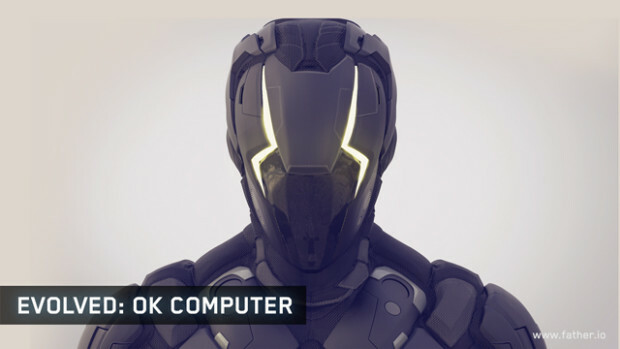 smartphone hardware created explicitly for gaming. 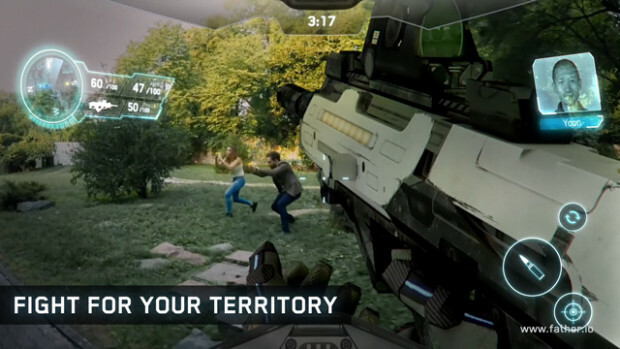 Attach the Inceptor to your phone and start shooting – up to 50 meters away – with a precise and well-collimated hitbox. Our hardware has been tested with hundreds of gamers and pro-gamers. We’ve implemented 6 highly sensitive, infrared receiving sensors, allowing Father.IO to offer unmatched, full gaming immersion. The inceptor sensors offer wide angles of reception (almost 90º), both horizontally and vertically, so a shot can be detected from any direction or angle around your Inceptor. With local broadcasting, lag times and bandwidth usage are reduced to a minimum. With an RTT of only 100ms, it feels like you are playing against an online server having just 30 to 50 ms of latency. 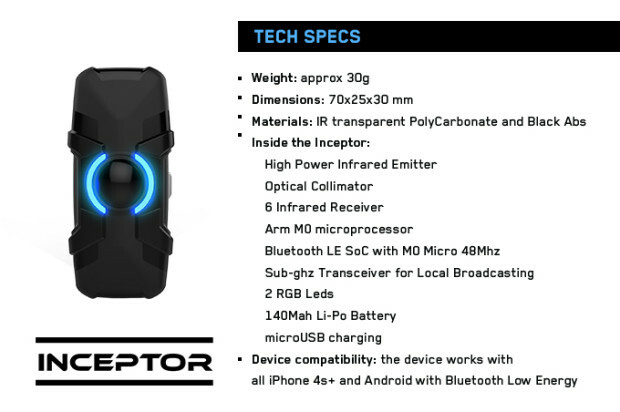 The Inceptor works with all iOS phones & Android with Bluetooth Low Energy. Windows phone is available as a social stretch goal mission. Father.IO is an alternate reality future, set shortly after the Technological Singularity. Artificial intelligence has surpassed human intelligence, the IoT connects the whole world to the Net. Humanity created “Ethereus,” a super-cloud computer, able to re-design itself, in a perpetual and hyper-accelerated process of artificial evolution. 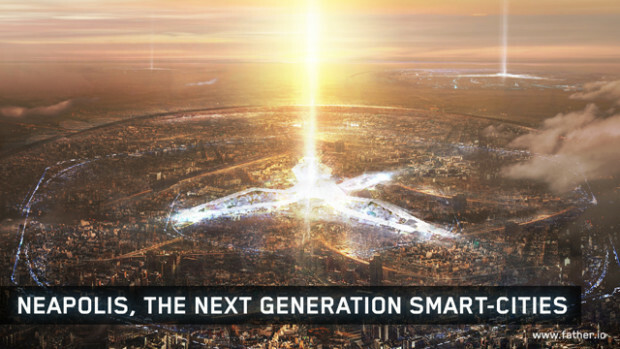 Ethereus optimized the world’s resources and industrial production, managing entire smart-cities and ruling whole countries, in an era devoid of racial, religious, political and economical conflicts. The world became a new Eden. Humanity began an evolution never before seen. 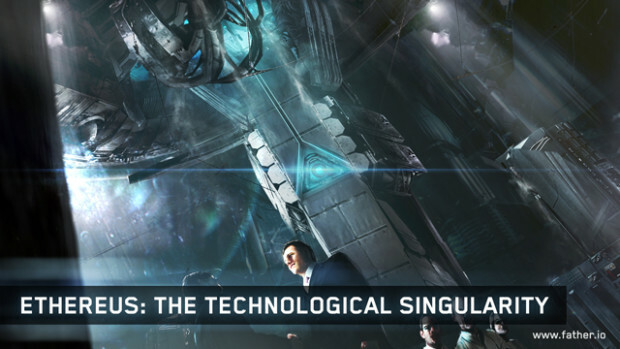 Humans utilized cybernetic and bionic augmentations, connecting their brains to Ethereus through the Net. Connectivity allowed access to the entire database of human knowledge and shared computational and predictive abilities. Until, Father.IO, a mysterious virus of unknown origin, attacked the Ethereus system. In defense, Ethereus began encrypting data banks and communication lines, shifting hardware, distributing itself into multiple data centers and even changing its physical properties. Despite its best efforts, the virus prevailed. Father.IO took over control of most of Ethereus’ capabilities, ordering all sentient machines to rebel. The virus began rising against a not yet fully evolved humanity, ordering its immediate extinction. The Evolved, a cybernetic life form specifically designed by the Father.IO virus, appeared to destroy all Humans. This is where the battle of Father.IO began – the ultimate rilvary between Humans and The Evolved. Every type of talent is needed in Father.IO. Select a class that best suits your combat tactics and playing style: some of them are great in battle, others have skills that make them exceed in the strategic gameplay. Militia: Access reliable guns, solid armor and increased tactical flexibility. An all around fighter with strategic capabilities. 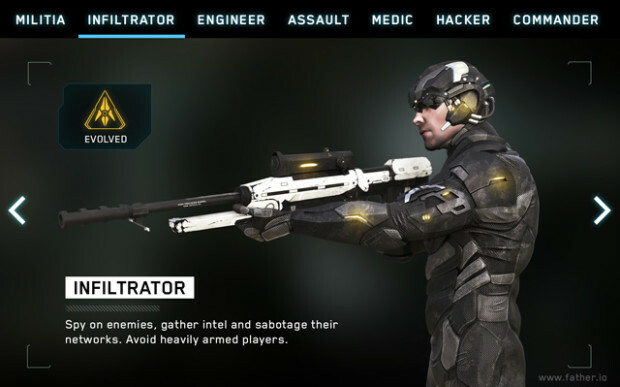 Infiltrator: Spy on enemies, gather intel and sabotage their networks. Avoid heavily armed players. Engineers: Quickly build support structures, plant EMP grenades and geolocalized mines. Provide a much needed tactical line of defense. 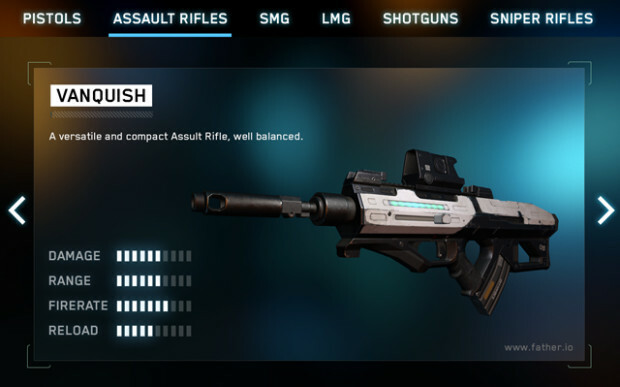 Assault: The thrill of combat keeps you going. A soldier with superior strength, devastating in medium range combat. Medics: The most appreciated and likeable class. 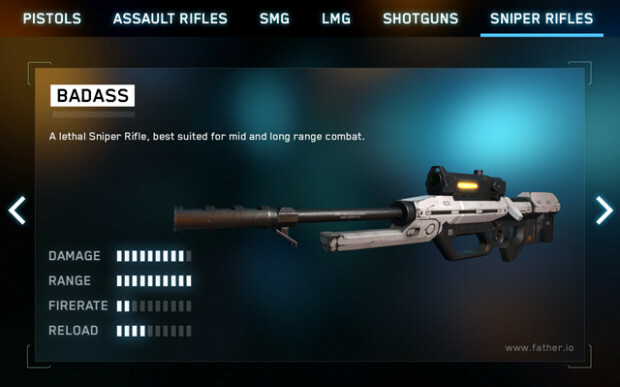 Speed along recoveries and revive your allies on the battlefield. 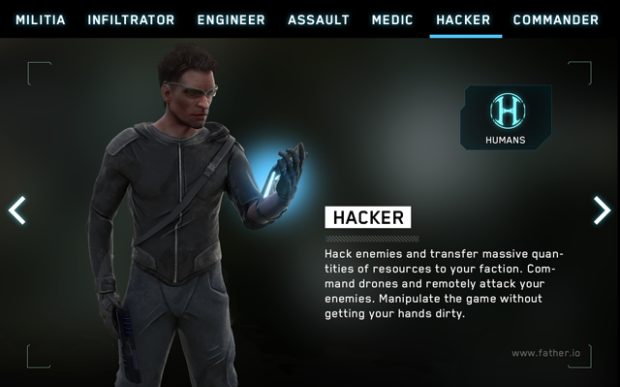 Hacker: Hack enemies and transfer massive quantities of resources to your faction. Command drones and remotely attack your enemies. Manipulate the game without getting your hands dirty. 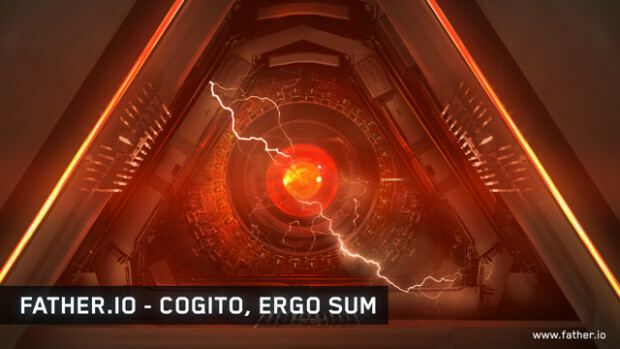 Commanders: Experts only. Fierce leaders, inspiring allies and leading factions with access to additional commands and veteran insights. See the enemy coming, issue orders, grant supplies; you are among the most elite in Father.IO. We’ve reduced professional outdoor laser tag equipment to the size of a keychain. Expect all the classic weapons, equipment, perks and attachments that you loved to use in your favorite old-school FPS series. 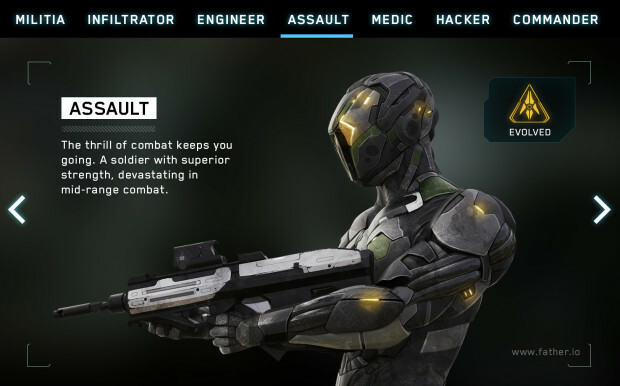 Some of the weapons you will be able to use are pistols, assault rifles, smg, lmg, shotguns and sniper rifles – each one with their own characteristics like damage, range and rate of fire. 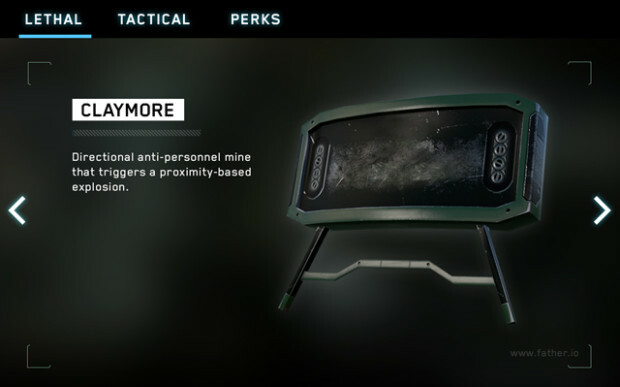 Geo-localization based equipment like claymores and EMP will help you defend your territories both in the strategic and in the action gameplay. Of course we won’t be able to teleport you on the respawn point if you get fragged (and no, we are not working on that). Want even more awesome features, weapons and options? Help us reach our stretch funding goals! Tell your friends about Father.IO to complete each level of our backer missions. 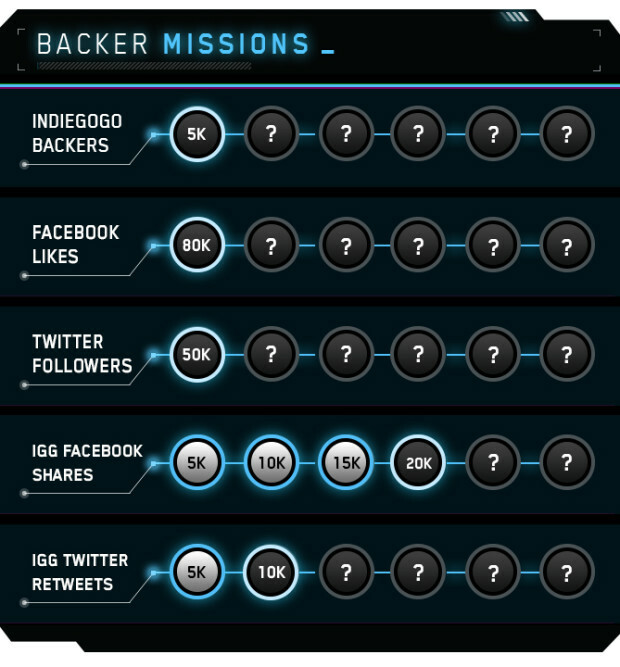 Each mission achieved will earn our backers a point toward a Social Reward. Unlock all 30 backer missions to access all Father.IO Social Rewards. 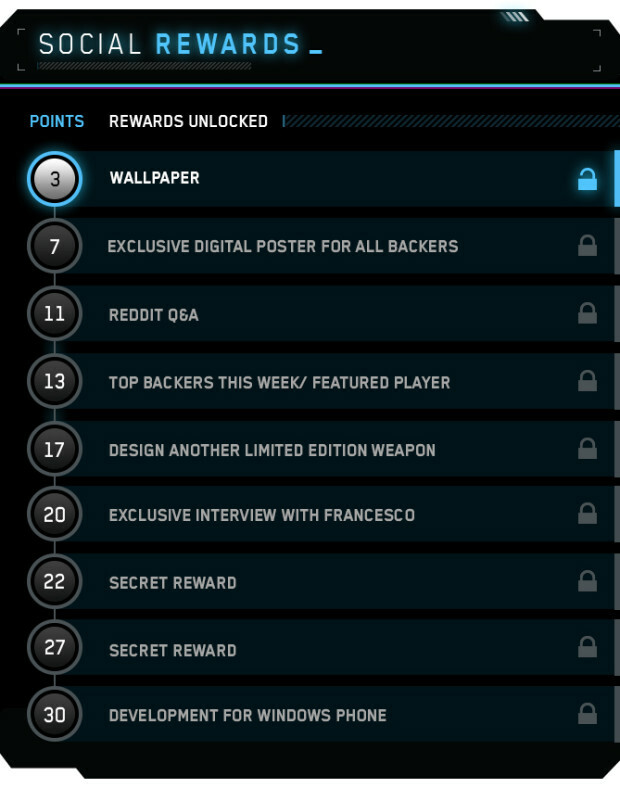 Achieve each backer mission to earn enough points to unlock all of the social goals below! Serial entrepreneur, (growth) hacker, digital strategist, full stack engineer. Coded first videogame at age 11. Industrial designer. 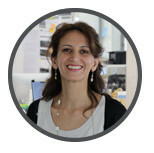 UX & Interface designer for Web & Mobile Applications, games and educational software. Backend and Frontend Ninja. 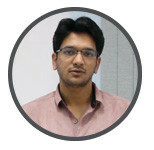 Previously VP of product of Freshmentors.com and engineer at UrbanClap. 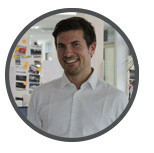 Investment Manager focused on startups and technology sector. Promoter and connector. 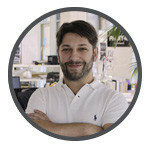 Founder & CEO of Industrio, the first italian hardware startup accelerator.